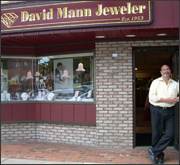 David Mann’s is the most professional and enjoyable place to purchase jewelry. They went above and beyond for me to find the perfect chain for me. I’m very thankful for them! This is the only place to go to for all your jewelry needs! My parents gave me a bronze bear necklace when I graduated geneseo nearly 3 years ago. The other day the lamp post snapped in half and I was devastated. I brought it back to see if it could be repaired and they replaced the bear for me no questions asked! What great customer service!!! They deserve six stars but but google only allows 5! We have been customers for several years. David and the staff are always helpful. He stands behind his work. If they don't have it in the case they will customize or order it for you. We won't shop anywhere else! One of the best stores in Geneseo Beautiful jewelry and reasonable prices.